“After watching incredible mammatus near Bassett, NE we headed east for some lightning photography. However, twenty minutes later we had to stop again because of the awe-inspiring colouring of this mammatus…. “After a good night sleep i went for a different processing of the photo (more dramatic) that i posted on my personal page. A beautiful positive lightning stroke right in front of me in the morning blue hour,a picture that i waiting for years :) . “I took this picture about a year ago in Hungen, 50 Kilometers in the north of Frankfurt (Germany). This was by far the most spectacular mammatus display I’ve ever seen in my entire life. After an exciting chase on 04.04.2018 we stopped next to Leipzig (Saxony) to shoot some lightnings on a backside of a thunderstorm. After the sun went down low-hanging mammatus clouds began to shines red and blue. I was just speechless, as I only saw such displays on photos from USA and was not expected to see it in Germany. As a bonus a small lightning found a way to the photo. 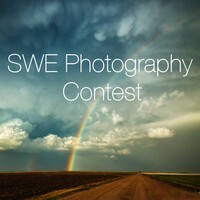 Congratulations to all authors in the SWE Photography Contest and thank you for participating in 2018! Here’s to 2019!